‘Shadowhunters’ Is Coming to New York Comic Con! Shadowhunters is returning to its New York City roots when the upcoming ABC Family adaptation hits New York Comic Con in October! The cast (Katherine McNamara, Dominic Sherwood, Alberto Rosende, Emeraude Toubia, Matthew Daddario, Harry Shum Jr., and Isaiah Mustafa), showrunner Ed Decter, executive producer McG and author Cassandra Clare will all be on-hand on Saturday to talk about the new show and debut the first footage from the show! The new ABC Family television series Shadowhunters, based on the New York Times bestselling young adult fantasy book series The Mortal Instruments by Cassandra Clare, follows 18-year-old Clary Fray, who finds out on her birthday that she is not who she thinks she is but rather comes from a long line of Shadowhunters – human-angel hybrids who hunt down demons. When her mother, Jocelyn, is kidnapped, Clary is thrown into the world of demon hunting with mysterious Shadowhunter Jace and her best friend, Simon. Now living among faeries, warlocks, vampires and werewolves, Clary begins a journey of self-discovery as she learns more about her past and what her future may hold. Shadowhunters is set to premiere in early 2016. Who’s headed to New York Comic Con?! 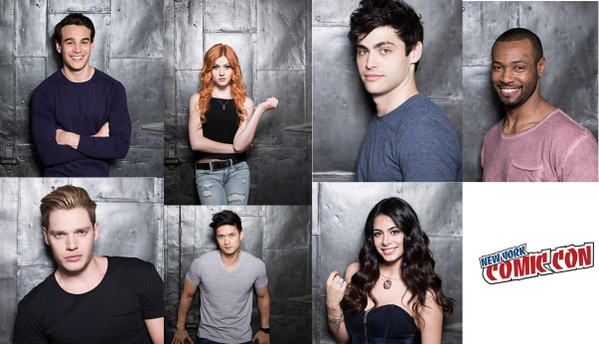 8 Comments on ‘Shadowhunters’ Is Coming to New York Comic Con! Can someone hurry up and invent teleportation please 😭 But anyway I’m very happy that they’re promoting so strongly already! I want to meet the cast, but if there was one main reason that I really really want to got to the NY Comic Con in October, it’s definitely to MEET CASSANDRA CLARE!!! She is so amazing! She is definitely my favorite author forever! @Dominika (serio? Mam identyczne imię nawet 🙂 Yeah, I know something about it, I wish I could go to New York then. I don’t live in America!!! AAAARRRRRGGGG!!!! I hate this! Why can’t they travel?!?!?! But why don’t they go to fanexpocanada since they are here already?? what about signing? will there be autographs??? and how much will they cost??! Guys I just realized something……THE BABES ARE ALL LEGAL!!!! !